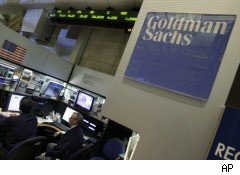 While Goldman Sachs (GS) has settled Securities and Exchange Commission civil fraud charges over its Abacus synthetic collateralized debt obligation transaction with a $550 million fine, its dispute with the Financial Crisis Inquiry Commission is ongoing. The FCIC now says it's considering sending in outside accountants to audit Goldman's systems for data on its derivatives business, the Financial Times reports. The FCIC will not back down from demands for information that Goldman's executives have maintained the company doesn't track, FCIC Chairman Phil Angelides told the Financial Times. He promised the commission would press Goldman hard. The information the FCIC is seeking relates to Goldman's derivatives trading revenue, but Goldman executives claim such data would be meaningless because it would only show one side of the trade and ignore the other: Derivatives, they say, were frequently purchased by the bank as hedges against its other investments, and their revenue only makes sense in context of those investments. Moreover, they told the panel the bank's accounting systems did not break out trading revenue generated strictly from derivatives. But Angelides is skeptical that's true. Goldman has recently fulfilled another request by the commission pertaining to counterparties from which the bank bought credit insurance on AIG (AIG). And while the bank also maintains it's continuing to work with the FCIC, the panel has recently called Goldman's response to its inquiry "abysmal."